Following is my personal TOP 10 solitaire games. The list doesn't rate the GAME per se or its mechanics, or how good the game is, but how much I enjoy playing it and how often I like playing it: the higher the rank, the more times I would like to play it over the lower ranked games. I am solitaire gamer 99% of the time (and only a very small % of the time I play with my lovely wife, who helps me play test my designs… and, sometimes, she likes them). I own mostly solitaire games (or games with a solitaire variant - either official or non-official). I was very skeptic over DDD, then I bought it and played a lot; then let it sleep on my shelf for 2 months. I was about to sell it, then, one night, my wife fell asleep on the couch, so I pulled it our and played… WOW it was a good game. I lost, but then played the map again back to back. I Bought this after seeing Joel Eddy's review and fell in love with it on a whim. WOW this game is clever. After 5-6 games, I started winning, and never stopped since; but this didn't stop me from playing Friday over and over again, just trying to beat my top score (which is 135 points at level 3). I even converted it to play on my iPAD using CARDWARDEN. Following at n.8: ELDER SIGN. I play it on my iPad more often then I play the physical version… does it even qualify? it's my list, so I say yes! Man, this game is fun. The physical version is WAY too easy, so I play it more often on my iPAD (for variety too), but it is a great game indeed. At n.7 comes IN MAGNIFICENT STYLE. Push your luck is my favorite mechanic (I always include a pinch of press your luck-ness in my own designs too), and this game manages to press your luck but with a purpose. It's "can't stop" with a theme, and very good one also. But the dice don't rule game: yes, they are a VERY important part of the game, but you're not just rolling dice and seeing what happens: you're first deciding who to move; then rolling, will you keep rolling? yes, no, will you use your general; will you use this chit? will you reveal that bombardment marker? where will you place that bombardment.. ok, it's not ASL, but its a quackish game that tells a good story. Recommended to anyone who likes light war games. What do you gain when you add miniatures, great art, a very good story, and dice? 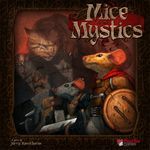 you said it: Mice and Mystics! This game is amazing to play when you want a light, tactical game with dice-chucking galore. 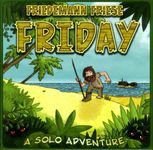 Don't expect MANY decision-making, because this game is not about precision movement and war-gaming, but following (and living) a story unfolding. Its only flaw is replay ability, but there're already expansions for it, so it's not a real issue. 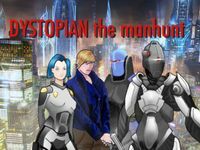 At number 5, my only design on the list: Dystopian, the manhunt. This might look like a self-sung song, a selfish self-promotion (try saying it quickly three times in a row), and… it probably is, though, maybe because it's my latest design, but I really enjoy playing it. So many decisions to be made, so many things to do, that Dystopian is a game I really enjoy playing. What I like best is the tile laying mechanic that leads your investigation to revealing who the actual criminal is. I am the designer, and, after all, I design games I like to play. If I had done this list 2 years ago, I would have ad one game on it, occupying all 10 slots, and it would have been LOTR:LCG. 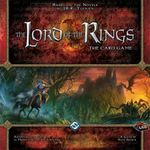 I played LOTR all the time (well, all the time I had to play games, that means; I have a real life, family and job, you know!). Now the game has faded a little, not because the game had bored me, but because there are more better games I prefer playing, nowadays. The best part of the game: the deck building part… creating your deck, to me, is the better part, compared to actually playing the game. Yes, eventually I have to play the deck I create, but, hey, I like building it, even if I don't get to play it on EVERY single scenario. At number 3, in the lowest step of the podium: Mage Knight the board game. This game is LONG; this game is BRAINBURNING; this game takes up ALL my table space, but this game is FUN FUN FUN! My only negative point is that it takes a little too long to play than I would like (and since I usually play at night, when I take this out, my wife won't see me enter the bedroom before 2 am). But man Mage Knight delivers! I Love how much your Mage Knight grows and gets better and stronger every turn. This is the best part of the game: using your newly gained powers and seeing how one card card drastically change the outcome of a game. Steady on the 2nd step of the podium: Castaways (or, as the Italian version I have: NAUFRAGOS). At first I wasn't interested on this game, but now I am hooked. It has everything you'd want in a game like this: story telling; decision making; dice rolling. What I like best about this game is that it actually feels like you're on a deserted island and you need to survive. The worked placement mechanic (very euro-y) works perfectly with the story telling; in fact, I cannot give the designer of Naufragosa higher praise for integrating so many different mechanics, into a VERY good game that, essentially has it all: do you enjoy a good euro? you'll love the worker placement mechanic for assigning your workers to performing actions to survive? do you enjoy story telling games? you'll love the exploration phase and watching the story unfold as a choose your own adventure book, where you're gonna face choices and have things happen that influence the outcome of the whole game. At first I loathed the game… hated it, when I saw the reviews, especially since everyone was raving about it, how good and fun it was. Then I found it a VERY reasonable price on book depository (34 euros), and said: what the heck, if I don't like, I'll sell it, and even manage to make a little profit off the sale… Oh boy, was I wrong! Well, I didn't make a profit, because I didn't sell it; in fact, I even bought the new expansion pack, which is arriving as I write. The game doesn't have as clever mechanics as the previous 2-3 games, actually, mechanic-wise, the game is quite bland. It is, ad its core, a flip-a-card, deal with the effects (passing check by rolling dice). But it's not the mechanics I like about the game, it's the fact that I am living full on experience that lasts (and is lasting for 3 weeks now). I LOVE how characters get better and better as I progress, I love how I get attached to them and don't want to see any of them die. It feels like an RPG (this has been said many times), though, IT IS NOT AN RPG in a box. I'll repeat it: it FEELS LIKE AN RPG. 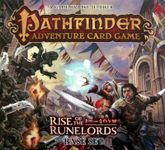 I am a former RPGer, back in my high school days, and Pathfinder has what I liked about playing RPGs: the fact that I was playing a character that had an evolution that lasted as long as I wanted it to last. The attachment I get with my characters is unbelievable, and every time I play I like how one of them can die and start all over. The experience I get from Pathfinder is exactly this: not a role playing game (because, lets face, it's not like when playing Pathfinder the card game you are roleplaying anything, as the story is already written for you on tracks you can't get off from), but the fact that you have your little tamagotchi character you want to see evolve and progress and that if you don't take care of him he might even die.